Peterborough Town skipper David Clarke batting against Rushton last weekend. Photo: David Lowndes. The top dogs are in town and a win could seal a surprise title success for the unbeaten outfit. 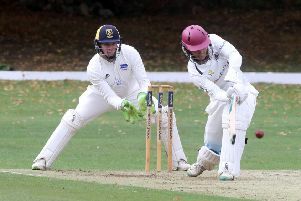 Peterborough Town teenager Kieran Judd batting against Rushton at Bretton Gate last weekend. Photo: David Lowndes. But Clarke insists his team have plenty to play for themselves, most notably ensuring a top two finish for the fifth year in a row. Town are currently third, 11 points behind second-placed Finedon with three matches remaining, so they can’t afford any slip-ups, even against a team who hammered them earlier in the season. “ON’s deserve to win the league,” Clarke admitted. “To go unbeaten for 19 matches is a great achievement in a tough competition. “They outplayed us at their place earlier in the season which was a disappointment as man for man we are as good as them. Marcus Howard will be a key man in Peterborough Town seconds' survival battle. “Good luck to them, but we want to take their unbeaten record away this weekend as we are determined to claim the runners-up spot. Clarke has named an unchanged side to face ONs (Town were probably saved from defeat at the hands of Rushton by heavy rain), thus resisting the temptation to strengthen a second team who have dropped dangerously close to the Division One drop zone. Town seconds are just four points and two places off the relegation places with three games to go. They are at mid-table Finedon seconds tomorrow. Rain didn’t do Town any favours last weekend as a superb innings of 56 not out (from 54 balls) from Marcus Howard had seen them to 105-1 from just 21 overs at fellow strugglers Isham. It’s effectively a Hunts Division One title decider at Port Lane, Castor tomorrow when Ramsey seconds are the visitors (1pm). Ramsey hold a 13-point lead going into the game following a nine-wicket win over Hampton last weekend, but Castor have a game in hand. March Town will secure promotion from Cambs Division Two with a win at leaders St Ives tomorrow. (11.30am) Premier Division: Peterborough Town v Old Northamptonians, Ruston v Oundle. (noon) Division One: Finedon 2nds v Peterborough Town 2nds. (12.30pm) Division Eight: Earls Barton 2nds v Oundle 3rds. (noon): Boston v Market Deeping, Bourne v Nettleham. (noon) Division One: Blunham v Wisbech, Ramsey v Ketton, Saffron Walden v Nassington. (noon) Division Two: Huntingdon v Newborough, St Ives v March, Ufford Park v Kimbolton. (1pm) Division One: Castor v Ramsey 2nds, Hampton v Burghley Park, Southill Park v Stamford. (1pm) Division Two: AK 11 v Bharat Sports, Blunham 2nds v Orton Park, Nassington 2nds v Peterborough Town 3rds. (1pm) Division Three: Alconbury v Huntingdon 2nds, Biggleswade v Hampton 2nds, Newborough 2nds v Houghton & Wyton, Ramsey 3rds v Werrington, Sawtry v Upwood. (1pm) Division Four: Ketton 2nds v King’s Keys, Orton Park 2nds v Hemingford Park. (1pm) Premier Division: Long Sutton v Grantham 2nds, Market Deeping 2nds v Boston 2nds, Spalding v Stamford. (1pm) Division One: Baston v Spalding 2nds, Moulton Harrox v Billingborough 2nds, Timberlands v Welby Cavaliers. (1pm) Division Two: Grantham 4ths v Pinchbeck. Graves Park v Long Sutton 2nds, Spalding 3rds v Burgh& District. (1pm) Division One: Nassington v Bourne, Peterborough Town v Oundle, Stamford v Barnack, Ufford Park v Market Deeping, Uppingham v Wisbech. (1pm) Division Two: Grantham v Castor, Ketton v King’s Keys, March v Uffington. (1pm) Division Three: Long Sutton v East Carlton, Wisbech 2nds v Stewart & Lloyds. (1pm) Division Four: Hampton v Thrapston, Isham v Ramsey, Kimbolton v Orton Park, Loddington v Nassington 2nds. (1pm) Division Five: Castor 2nds v Benefield, Laxton v Sawtry, Market Deeping 2nds v Alconbury. (1pm) Division Six: Newborough 2nds v Long Sutton 2nds, Orton Park 2nds v Ufford Park 2nds, Whittlesey 2nds v Huntingdon.